We’ve made it to Friday again! I am so thrilled about today for two reasons. First, it’s my sister’s birthday! I got to talk to her for about 40 minutes this morning and she has a lovely day planned and I’m very happy for her. I do wish I could be there to celebrate with her, but that’s how it goes living 1200 miles from your family. The second reason is I get my wedding dress back today! I dropped it off in January and get to pick it back up today. Thankfully it fits like a glove, so the only thing I had to do was get the bustle added which was pretty inexpensive. But I can’t wait to go try it on because every time I do, I never want to take it off! I seriously feel like a princess. Click any of the links to shop the look! I’m always so happy to get home on Friday afternoon and know that I’ll get to sleep in the next day. Anyone else feel that way? The weather is not helping with me wanting to be home and sleep lately! 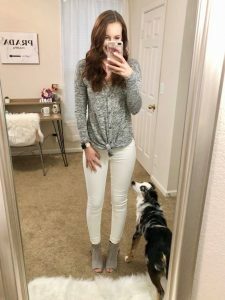 These white jeans I wore are so comfortable and perfect for Spring. I’m trying to look Springy since it doesn’t feel that way. When it finally gets warm here, I have plenty of outfits I plan to wear them with. I have so many cute floral Springy tops that I just haven’t been able to wear yet since it’s too cold, but white makes me feel polished and put together. 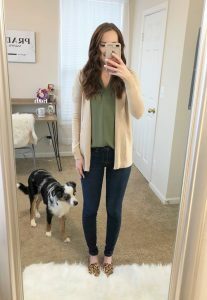 The top I wore with them is from Target, but I linked a similar one here for you guys. I get in trouble when I shop at Target…I always leave with way more than I intended to. 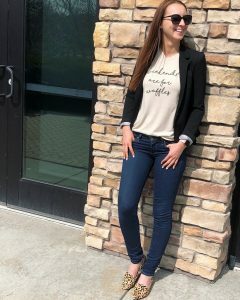 I get a lot of compliments on these Dolce Vita open toe booties, and they are sooo cute and perfect for spring! The blush laser cut shoes I wore on Thursday are perfect for Spring! I got mine from Justfab, but I found very similar ones here and here, and I also LOVE this pair and this pair. This week at work, we had a lot of big meetings to make some important decisions for some of our projects, and it gave me an excuse to break out my blazers more than usual. Here is my black one (less expensive here) and my light grey one here. 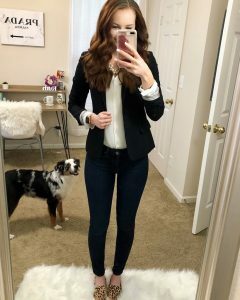 I love getting a chance to wear a blazer with jeans (or a full suit) because it gives me a wonderful confidence boost! I feel so put together and like a best version of myself. If you’ve ever seen Never Been Kissed, that scene in English class where Mr. Coolson is talking about Shakespeare and how what you wear can be liberating and make you act or feel differently. Blazers just give me that extra oomph to take on the day. My shirt from Sunday’s outfit is actually from this matching PJ set. I love how soft and comfortable it is (and I love matching sets!) so I figured I’d throw a blazer over it and no one would know! The floral pants is comes with are amazingly comfortable, they’re like jogger leggings and both have gotten even softer since I washed them. The other two things that made me feel good this week are these amazing leopard print Steve Madden loafers and this super soft faux suede Moto jacket. I can’t emphasize enough how comfortable it is. It’s super stretchy and isn’t restricting at all, which is my favorite thing about it. I also love the drape front of it because it’s kind of like a cardigan Moto jacket combo. It’s so very lightweight, so it’s perfect for Spring. Love, love, love it. Both of these items are from my last Trunk Club box! My stylist actually got promoted so I just got a new one, but I’m excited to see what her take on my style will be. My sweater from today is from my last Stitch Fix box, and I just got another one so that review will be up soon! I’ve also gotten a bunch of questions about how I’ve been styling my hair this week, and I plan to make a tutorial over the weekend and share my new T3 curling wand with you guys and how to use it, so stay tuned for that in the next week or 2! Easter is this weekend, but it’s supposed to be really cold Sunday so I’m hoping I can still wear my new dress! I might just have to layer up. What are your plans for this weekend? ?